"They are disrespectful toward each other, it's hard for them to get along. (There are) problems with breaking and stealing." "There is a lack of persistence, (the kids) give up on the process because of poor products." "(The kids) are off task and have disruptive outbursts due to lack of understanding the process." "They talk when I talk, even 'good' kids." "They don't listen, they're distracted and have a lack of respect for the teacher." These are statements from Alabama art teachers in schools where over 75% of students qualify for free or reduced price lunch. 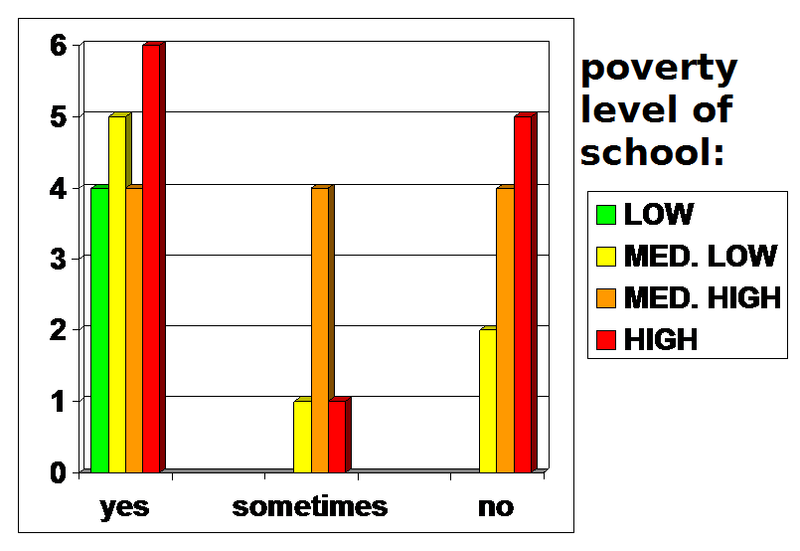 For the past month, I have been investigating what differences there might be in classroom management challenges for teachers who find themselves serving a variety of student cultures, specifically those in high poverty. 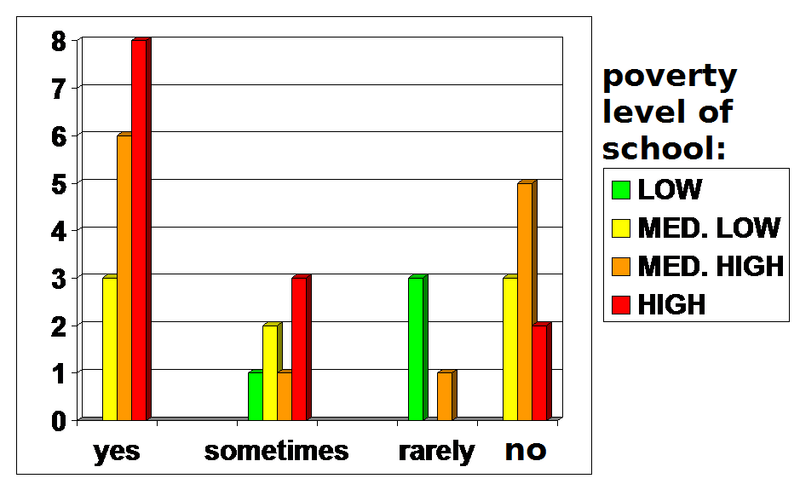 At the top of this post is a chart showing the behavior concerns reported by art teachers here in Alabama who completed the "Culture Survey" on March 13, 2015. 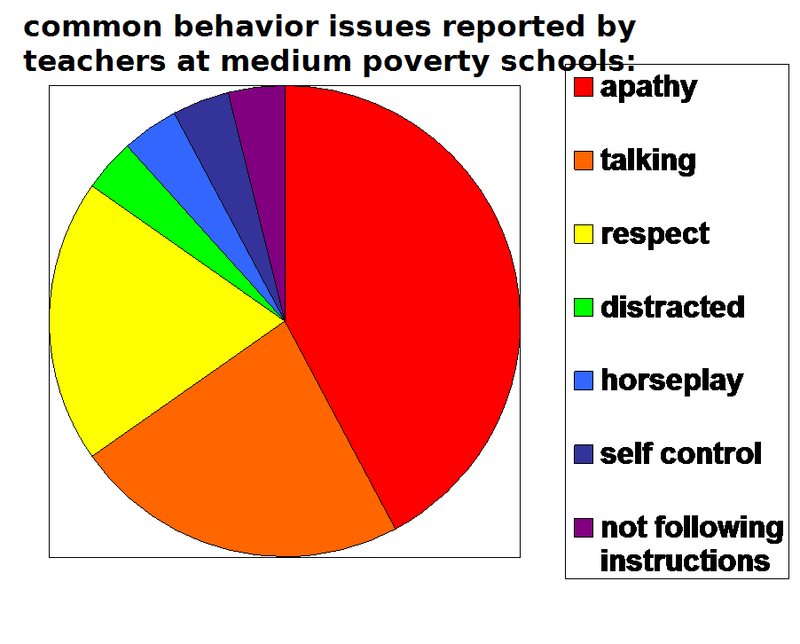 At the bottom of this post is the same information, but simplified to show the most common concerns for all teachers. 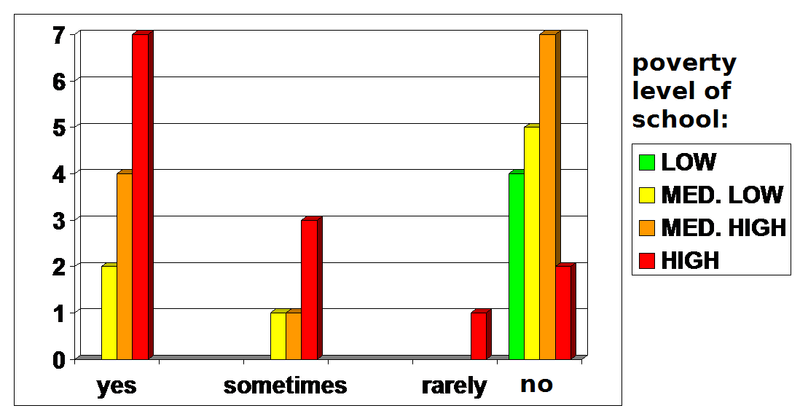 Also, I asked my colleagues several questions related to school culture, the survey results of which are posted below. 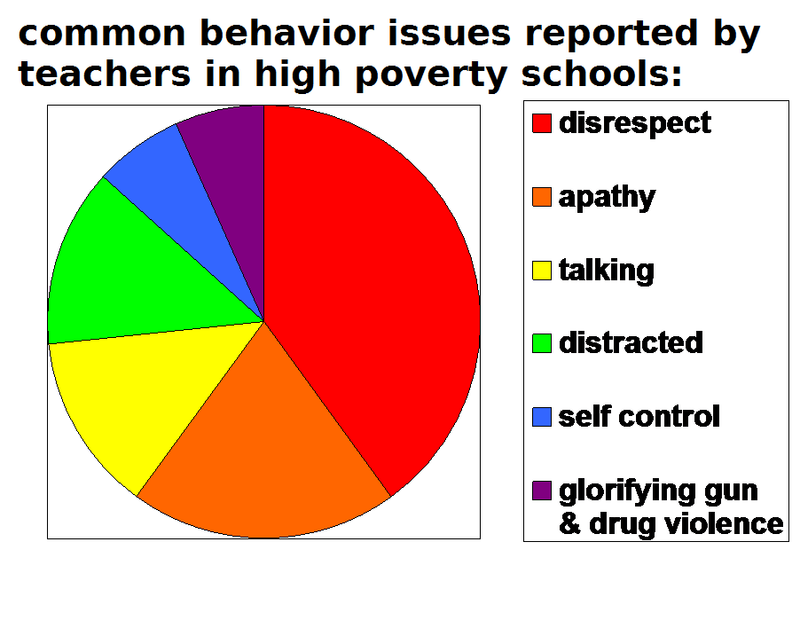 Finally, I have a list created by education expert Eric Jensen that outlines behavior issues specific to impoverished children. 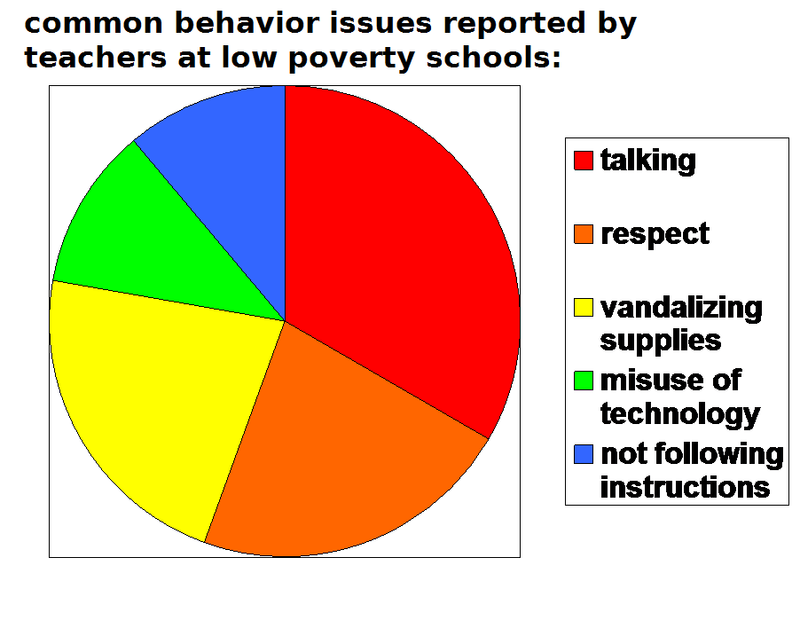 Teachers were asked, " What do you consider to be the most prevalent behavior issue in your classes?" "When students experience poor nutrition and diminished health practices, it's harder for them to listen, concentrate, and learn." "Kids from low-income families are less likely to know the words a teacher uses in class or the words that appear in reading material. When children aren't familiar with words, they don't want to read, often tune out, or feel like school is not for them. 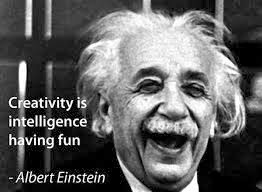 Also, many students don't want to risk looking stupid (especially to their peers), so they won't participate in class." "If students think failure or low performance is likely, they'll probably not bother to try. Similarly, if they think they aren't smart enough and can't succeed, they'll probably not put out any effort." "Many children who struggle cognitively either act out (exhibit problem behavior) or shut down (show learned helplessness)." "Classroom misbehaviors are likely because many children simply do not have the at-home stability or repertoire of necessary social-emotional responses for school. 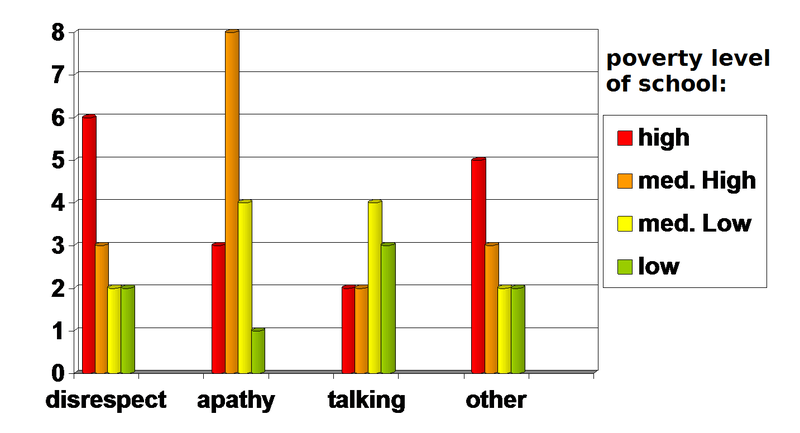 Students are more likely to be impulsive, use inappropriate language, and act disrespectful—until you teach them more appropriate social and emotional responses." "Distressed children typically exhibit one of two behaviors: angry 'in your face' assertiveness or disconnected 'leave me alone' passivity. To the uninformed, the student may appear to be either out of control, showing an attitude, or lazy. But those behaviors are actually symptoms of stress disorders—and distress influences many behaviors that influence engagement." "The more aggressive behaviors include talking back to the teacher, getting in the teacher's face, using inappropriate body language, and making inappropriate facial expressions. The more passive behaviors include failing to respond to questions or requests, exhibiting passivity, slumping or slouching, and disconnecting from peers or academic work."